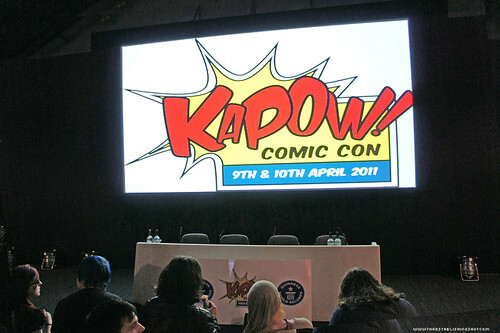 Day 2 of Kapow! Comic Con came to a close with the screening of Movie: X. There had been much talk of what Movie X might be in the run up and most had bet that is was to be the first screening of Marvel's Thor. After all those in the know where aware that The lead was a cape wearing super hero with a funny sounding name. However when it was revealed that Movie: X had an 18 certificate I though it might be Mark Millar's gritty Scottish super hero film Miracle Park or James Gunn's Super. Only thing was I was pretty sure that the hero from Super didn't wear a cape and that SCI-FI-LONDON Festival were supposed to have the UK premier later this month. Kapow! 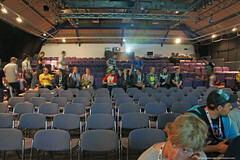 Comic Con : Movie X audience packing in, a photo by Craig Grobler on Flickr. Kapow! Comic Con : Movie X is 18, a photo by Craig Grobler on Flickr. Kapow! Comic Con : Movie X, a photo by Craig Grobler on Flickr. When Millar revealed that he was still busy with Miracle Park and would be shooting this Summer earlier in the day at the Millarworld Panel I was almost sure that Super was going to be Kapow! 's Movie X screening. Right now super heroes are all the rage and everyone is trying to cash in. But even the big studios have fallen short with “sure” hit adaptations of much loved works. I first heard about Super, only after the trailer was released a couple of months ago onto IMDB. Which is relatively late for me to get the heads up on a film. A fact that mis-led me to believe that Super wasn’t going to hit the mark and that it may be another mediocre effort to be lost in the sea of wanna be Super Hero flicks, and let’s be honest there are a lot of them out there. Also I was a little put off by Rainn Wilson heading up the film. I’m not the biggest fan of his style of comedy also it seemed very similar to Woody Harrelson’s 2009 Defendor, so I wasn’t overly excited about it and although I was intrigued with the rest of the cast that included; Ellen Page, Liv Tyler, Kevin Bacon and Michael Rooker I thought I would probably end up seeing it on DVD or TV at some point, until I found out that it was going to be the closing film of the 2011 SCI-FI-LONDON film festival later this month, where I thought I'd catch it. As cinema going audiences become more exposed to the super hero world, creative’s have been exploring untapped parts of the genre and recently we have seen the rise in powerless heroes which is the conceit of Super and fits Kapow! Comic Con’s do it yourself motif very well. In Super, Rainn Wilson plays Frank D'Arbo a fairly regular guy whose two best memories are; the day he married Sarah (Liv Tyler) a girl way out of his league and the day he “helped”, a police officer by pointing in the direction a criminal had just run in. He doesn’t have the most glamorous life but he is content with his lot as he has his wife by his side. But then tragedy strikes when Sarah a recovering alcoholic falls in with seedy gangland club owner Jacques (Kevin Bacon). The cringe inducing social ineptness of Rainn Wilson’s character gets turned up to the extreme, as without his wife - his life becomes unbearable and he slowly slides into delusion which eventually manifests itself in religious messages leading to psychotic behaviour. Obsessed with saving Sarah from Jacques he adopts the alter ego of the heroic Crimson Bolt and after a bumpy starts hits his stride as he vigilantly starts serving up brutal beat downs to criminals around town. 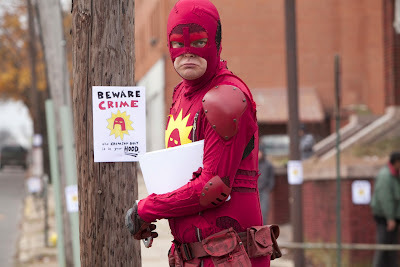 I have to say Rainn Wilson persona seems to have been have custom made for this character. 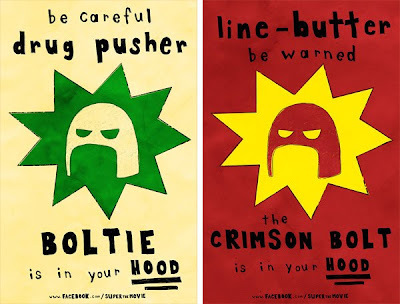 He is completely believable as the regular guy and then as the Crimson Bolt making it up as he goes along. 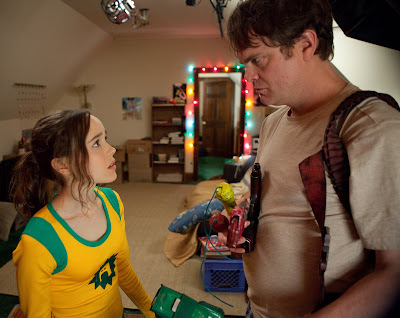 Another stand out performance for me was from Ellen Page as a comic shop type person. They meet when Rainn’s character is doing some research for his new super hero role. I think her character should be inducted into the hall of great Super heroes. I don’t want to give too much away but she is truly marvellous to behold as she moves from excited fan girl to complete out and out psycho. The story is told through Frank D'Arbo’s daily life as he transforms into a guerrilla super hero and veers from cringe worthy embarrassment, laugh out loud funny, surreal weirdness and brutal violence and blood. I was completely taken by surprise and absolutely loved Super. Where it is different from all the other wannabe stories is that it isn’t trying to be like something else and it certainly isn’t trying to cash in on making Rainn Wilson’s character fanboy friendly or overly relatable like so many other films that keep trying to tell us how great it is to be fanboy and what if “we” become the hero. That whole concept was a lame cash in to start with and really just tired now. By the time Super was hitting the final scenes I was in awe of what they accomplished, they had created a pseudo realistic universe with genuinely scary villains and heroes that man up to the challenge. Super tells a very traditional super hero story whilst being adult, fresh and original with more in common with comic style super heroes than most films of this ilk. The Kapow! crowd loved it and were cheering in all the right and some of the wrong places. 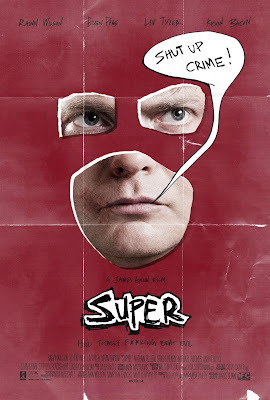 Super doesn't have a UK release yet but you can catch it at the SCI-FI-LONDON Festival closing night Mon 2 May, 2011. Kapow! 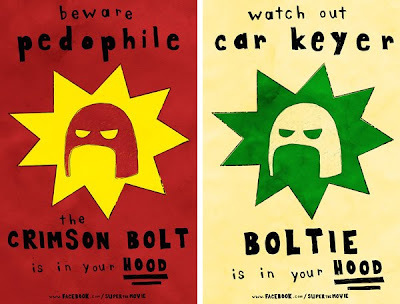 Comic Con : Movie X, originally uploaded by Craig Grobler.